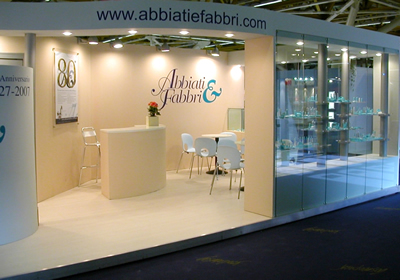 Abbiati&Fabbri and Cosmoprof 2007 - A memorable year! 2007 will be a memorable year not only because it was the year of our 80th anniversary. The biggest worldwide fair for our sector, Cosmoprof, reached its 40th anniversary and did so in the best possible way as the recent Bologna's edition was fully booked. The overall fair visitors number reached a new peak and a new record was established: more than 145.000 visitors and over 2.000 exhibitors, more than half of which being not italian, as a concrete sign of the growing international attention for this fair. Our stand witnessed a growing number of visitors and huge interest for all the novelties that were on display and for our evergreen product lines. Next appointment? Don't miss next year's edition, we're looking forward to meet you there!